Recently, I was fortunate to visit Abu Dhabi. The city has an impressive resume - it's UAE's political, cultural and commercial centre, UAE's capital city, Dubai's satellite city and over 8 years ago was even declared as the world's richest city by Fortune Magazine. Abu Dhabi didn't disappoint. I had a great time there and found the city fairly easy to navigate. Distances are not too much, taxis are abundant and the fares don;t really burn a hole in the wallet. People are friendly and you sink into comfort zone when you spot familiar brand names in shopping malls. Here's what you simply must explore if you find yourself #inAbuDhabi. This is a luxury five star hotel propped right in the heart of the city. Major attractions are not too far from here making this a convenient stay option. At first glance, the exterior of the hotel which is inspired by 17th century French architecture, will remind you of the Grand Budapest hotel. Arrive at the porch and as your car door is swung open for you, you are hit with the scent of rose wafting out of the Hotel's revolving doors. Walk into the lobby and you will be mesmerized with the grandeur and opulence of the interiors. Everything from the chandeliers, to the wall paper and furnishings speak royalty. In the lobby, sip on hot kahwa (many hotels serve traditional Arabic coffee for free) as you wait to be checked in. 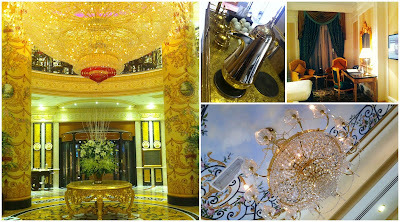 Opulence follows you even once you are ushered into your room (I recommend the Grand Deluxe Room). It's spotless clean, the beds look inviting and the TV screen has a welcome message personalized with your name. Things just get better when you explore the bathroom, what with the Roberto Cavalli toiletries to indulge in during your stay. The breakfast buffet held a good spread starring local dishes along with Asian dishes like Congee and noodles, and an assortment of breads, cakes and fruits. There's a pool on the rooftop and a Jacuzzi where we let our tiredness from the day's exploring melt away. Overall, a fantastic hotel to stay at and one I really recommend owing to the unwavering opulent Arabic touch to your trip. Open to believers and non-believers alike in 2008, this mosque is a proud testimony of Islamic architecture. It is rated as #2 on TripAdvisor's world landmarks to see list. It stands majestically as you make your way into the city from the airport. Watching photographs and video footage of the mosque is one thing, seeing it in person is just a whole other experience. Made with Macedonian marble, the architecture and design of the stark white mosque boasts of precision and symmetry. The carpet in its main prayer hall is considered to be one of the world's largest carpets. Its many glimmering and ornate chandeliers are made with Swarovsky crystals. Entry to the mosque is free and there is a heavy security check before you finally make your way into the mosque. Women are expected to be fully clothed and abayas are given if you don't have one. Photography is allowed in the mosque. 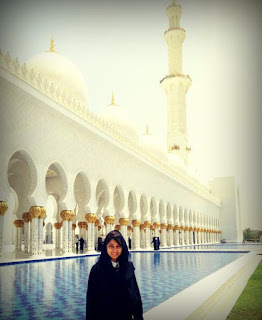 The mosque grounds, the facade and its domes are spotless clean and immaculately white. There are also guided multi-lingual tours and audio guides. 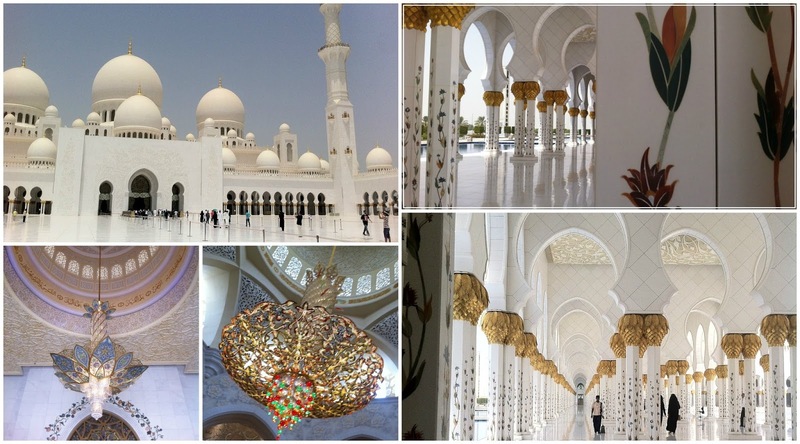 Today the mosque stands as an artistic masterpiece welcoming hordes of tourists every year. At Yas Mall, you'll get the best in shopping and dining. The mall is vast and seemingly endless. We spent around 8 hours in there, walked in during light and walked out at night. There's just so much to do and see whether you're going to shop or not. The mall is connected to the largest outdoor theme park Ferrari World, home to the world's fastest roller coaster beneath its iconic red roof. A day ticket costs AED 250; a tad pricey if you're not a Ferrari fanatic. 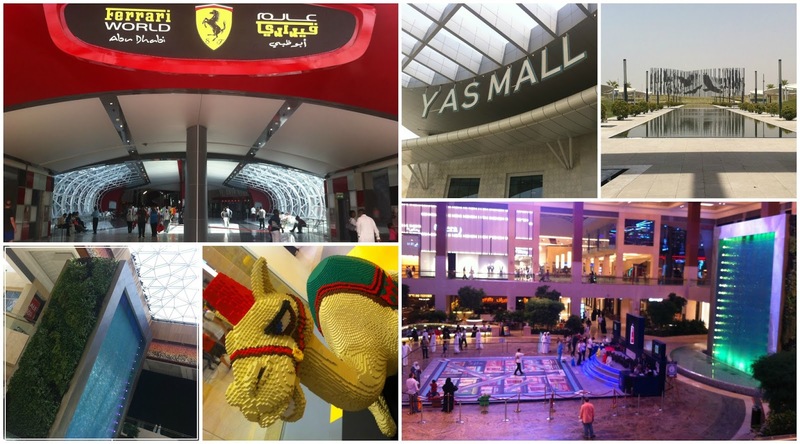 However, walk into Ferrari World, there's lots to explore even before you reach the ticket counter. Enter the merchandise store, marvel at the various engine displays and Ferrari cars - all without spending a dime. Yas Waterworld is also close by and warrants a full day. The park is themed around a local story of 'The Lost Pearl'. For AED 120 (adult), you can even go on a behind the scenes high octane tour of the Yas Marina Circuit. This is a lengthy stretch along the pristine blue beach. The promenade is dotted with parks, play areas, pedestrian pathways and cafes. Entry to the public beach area is free. Choose pedals over your feet, the best way to explore the Corniche is by renting from a selection of different cycles. Avoid visiting after dark - its beauty must be explored before dusk. Also, the restaurants and cafes are few and unappealing. We walked across the street to eat at the new Pita House and returned back to the promenade for some ColdStone fix. Pick up city maps and guides from the airport. Even your hotel will have these. These are comprehensive, easy to navigate, and very helpful to plan your itinerary and identify what's where. Hotels also generally have What's Hot or Time Out, a monthly magazine that'll keep you abreast with the city's happenings. Avoid going to the Heritage Village. It is a reconstruction portraying ancient life in dessert villages. Though the entry is free, there is not much to see there. What's more discouraging is that once out, you will find it extremely hard to hail a cab. There are almost none passing that route. We were left with no option but to walk over a kilometer in the afternoon blistering heat towards Marina Mall until we finally found a cab. On our way there, we were even stalked by a white car with tinted glass windows from within which Arabic and then Bollywood music was blaring. It passed by us several times, each time driving slowly and close to the pavement we walked on. It was scary, very scary. BigBusTours also operate here. You get a day bus ticket for AED 230 per adult and you can hope on and off the familiar red bus that stops at all the city's landmarks for you to explore. However, see what works for you. Since we were travelling in a group of 3, taxis worked out very well for us in terms of price and convenience. The famed Emirates Palace is recommended as a must-visit. However, we were denied entry and told that the Palace is no longer open to tourists. This policy may change so try your luck so that you don't miss out on seeing 85 hectares of gardens, the natural bay and the hotel which is supposed to be the epitome of luxury. Travelling to Dubai from Abu Dhabi is phenomenally convenient and just 50 minutes away by bus. Simply go to Al Wahda mall's bus station and you can get yourself a bus ticket to Dubai for AED 25 per person. Air-conditioned buses leave every 15 minutes. They are clean, comfortable and also fitted with WiFi (which couldn't for some reason be enabled on my phone). Once in Dubai, get off at Al Ghubaiba. Carry an ID everywhere you go. Avoid carrying your passport; I would recommend a driving license. If you're social media savvy, use the official hashtag #InAbuDhabi and even explore other tweets put out with that hashtag, you never know, you may find out about something new to explore! Abu Dhabi is soon going to be known as a global cultural centre what with the newest landmark the sand dune shaped UAE Pavillon and the opening of the Louvre in 2015, the Guggenheim in 2017 and the Zayed National Museum in 2016. For any help or information you might need while planning your trip to Abu Dhabi, Visitabudhabi.ae is a good resource.